Wood Furniture in Just One Step! 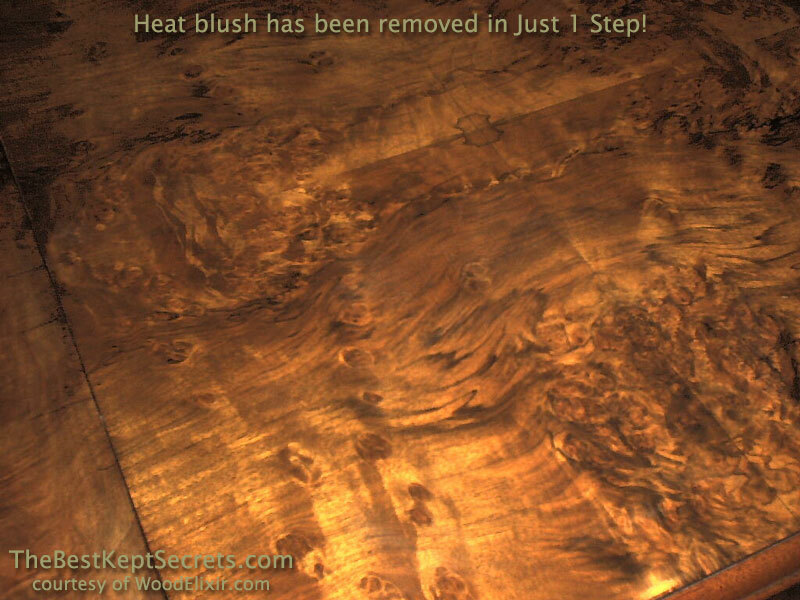 Now you can solve most common furniture finish problems in Just One Step. Remove white water marks, heat blush, smoke smell, mold & mildew, candle wax, magic marker, water-based stains, pet "accidents", and oil-based stains, and much more. 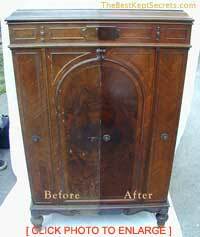 Avoid the mess and expense of refinishing your fine wood and antique furniture. Use Wood Elixir to clean, restore and protect your finished wood with an easy wipe on, wipe off application. Click here to order Wood Elixir! Stock Status - All Wood Elixir kits and products are in-stock and ready to ship. 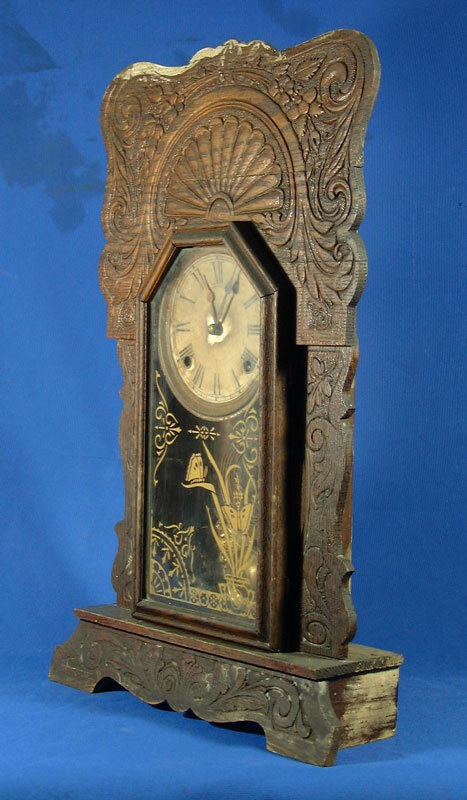 for antique and wood furniture! 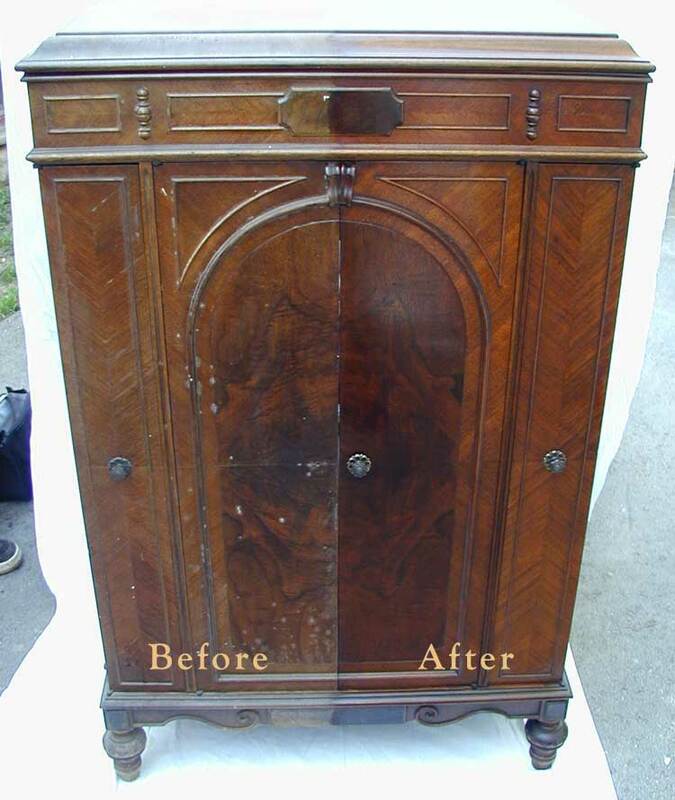 Dr. Woodwell Wood Elixir has been used by antique dealers to restore the original beauty of furniture for sale, without the expense of refinishing and the resulting loss of an antique's valuable patina. And now, this "best kept secret" is available to you! Order using the secure PayPal "Add to Cart" buttons at the bottom of this page. What does Wood Elixir do? 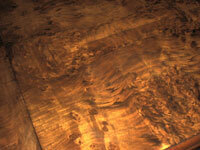 Wood Elixir often eliminates the need for expensive refinishing! Click here to order Wood Elixir on-line, or visit The Furniture Clinic to search how Wood Elixir will solve your furniture problem in Just 1 Step! For more detailed information on Wood Elixir, click here (link will open in a new window; simply close the new window to return to this order page) or read our Frequently Asked Questions page. With antique furniture especially, much of it's value is in the original finish and patina ... removing the finish is like trying to increase the value of a silver-plated tea service by removing the tarnished silver plating! 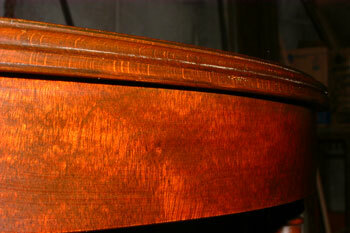 Often, the value of antique funiture is actually REDUCED after refinishing ... Wood Elixir restores the ORIGINAL finish. So, this is a cleaner? While Wood Elixir is a powerful cleaner, it also penetrates the finish to help solve many serious furniture finish problems. 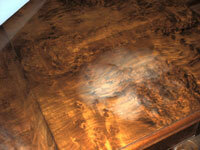 Wood Elixir will even reamalgamate and bond the dried, flaking finish found on some antique furniture. 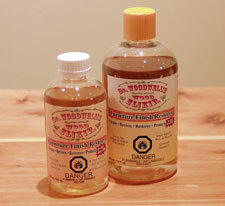 Dr. Woodwell Wood Elixir also cleans painted tin toys, decals and transfers, and combination items (i.e. wood, metal, leather). 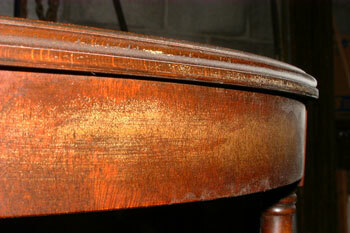 In fact, many "furniture cleaners" on the market today leave behind harmful build-up over time ... some even use silicone! Simply "wipe on, wait a moment, then wipe off" is usually all that's needed! Full directions can be viewed by clicking here. (Adobe Acrobat required - Download it for free here.) For more detailed information on Wood Elixir, click here (link will open in a new window; simply close the new window to return to this order page). to it's original beauty (photo 3). "Russ, to my surprise it [the Wood Elixir ] was here today! So I already got it on one of my old phonograph machines and it looks great. 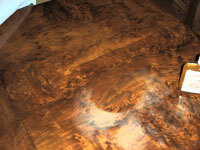 I will continue to experiment with the stuff and see what else it can do. Thank you for your stuff"
"I tried [Wood Elixir] on my kitchen cabinets, that we were going to replace and WOW! They improved so much we are going to do all the kitchen cabinets with the product rather that replace them. Do you offer the product in a bigger size?" After Water damage on this dining table is quickly restored by brushing on Wood Elixir, waiting a few minutes, then buffing with a clean cloth. Wood Elixir is a must-have for any home with wood furniture, and is ideal for the do-it-yourself'er, hobbyist, wood worker, or antique collector! 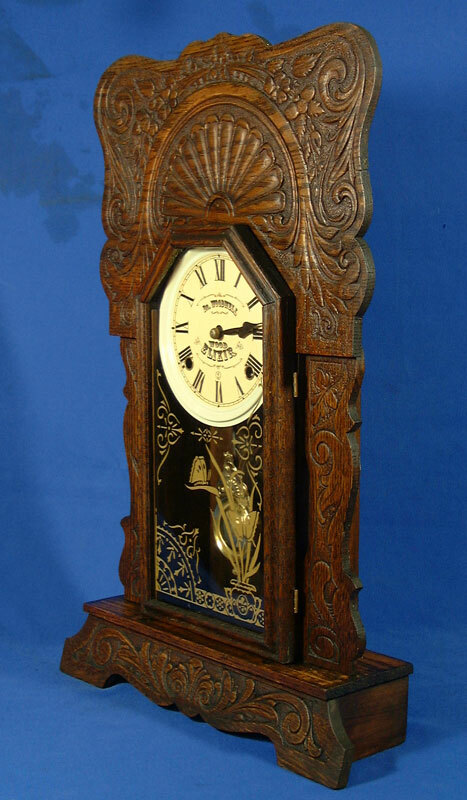 why it was invented by an antique dealer? Click here. and use the search feature to locate previous answers to your question. Wood Elixir is like nothing else on the market ... it truly is a "best kept secret"! If you're wondering how Wood Elixir compares to "competing products"
We all have wood furniture, and I'm constantly amazed at the ways having a bottle of Wood Elixir in the house helps me keep my wood furniture, doors, and trim looking beautiful despite the best efforts of teenagers and pets! Includes an 8 oz. 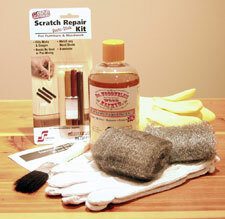 bottle of Wood Elixir, Scratch Repair Kit, bristle applicator brush, pair of handy buffing gloves, pair of protective gloves, pad of extra fine (#0000) and medium (#1) steel wool, and instruction sheet. Includes a larger 16 oz. 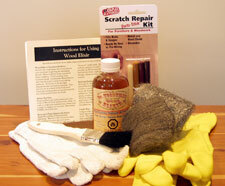 bottle of Wood Elixir, Scratch Repair Kit, bristle applicator brush, pair of handy buffing gloves, pair of protective gloves, pad of extra fine (#0000) and medium (#1) steel wool, and instruction sheet. Questions? - Please view our Frequently Asked Questions page or The Furniture Clinic discussion board.